Most people are aware that many snakes have fangs which are involved in the delivery of venom. What is not well understood is how snake fangs actually work. This post is “fangs 101” providing a basic description of the different fang types and how they work. Firstly to warrant having fangs it makes sense to actually be venomous! Venomous snakes all have some type of venom gland located above the jaw to pump venom (basically modified saliva) through the fangs often giving the snakes head a ‘square’ look. Venomous snakes can be found in three* families – Elapidae, Viperidae and Colubridae. In Australia we have only Elapids (front fanged snakes) and Colubrids (rear fanged snakes) with all our elapid species and one of our colubrid species being venomous. Lets look at the fangs of each of these snake families independently. Vipers have solenoglyphous fangs – the most sophisticated and visually impressive fang type. Solenoglyphous fangs are very long and hollow capable of penetrating deeply and injecting the snakes venom directly into the bloodstream. 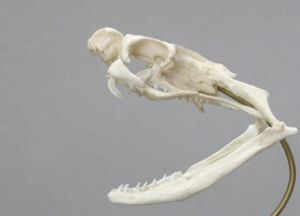 The fang itself is attached to a hinged bone called the maxilla allowing the fang to be folded flat when the mouth is closed but quickly erected when the mouth is opened. This hinged maxilla is what allows the vipers to have such large fangs when compared against other venomous snakes. Venom leaves solenoglyphous fangs not from the very tip but from a small slit at the bottom front portion of the fang allowing for a very sharp point that easily penetrates through tissue. 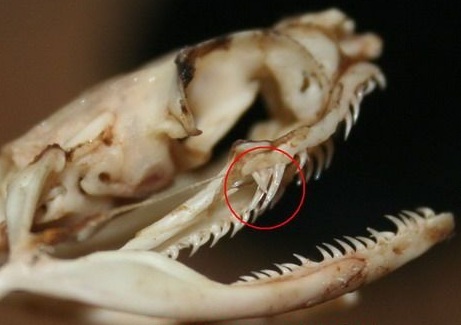 Elapids have proteroglyphous fangs which are short and fixed to the front of the mouth. 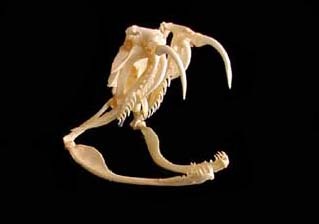 These fangs, like in vipers, are attached to the maxilla however in elapids the bone is not hinged and does not allow the fang to move. Generally in elapids and many vipers there will be a second fang present on each maxilla to replace the first ones when they are lost, both of which are hidden under a membrane called the fang sheath. Infamous venom shooting snakes such as the spitting cobra have proteroglyphous fangs with very fine, rounded holes creating the required pressures and allowing for increased accuracy. Because elapid fangs are short the venom is injected into the lymphatic system and must be transported to areas such as the groin or armpits to enter the blood stream and begin to effect the victim meaning the pressure immobilisation technique (found here) can buy a bite victim enough time to find medical help. This is very lucky for us as the elapid family contains many of the most dangerous snakes on the planet! Most rear fanged coubrids are non-venomous or only weakly venomous however their are some exceptions to this including a couple of notorious South African snakes. Colubrids have opisthoglyphous fangs which unlike solenoglyphous or proteroglyphous fangs are not hypodermic but instead have a groove or channel that directs the venom to the bite site. For this reason the snake must “chew” the venom into its prey with the venom load limited by the duration of the bite. The venom duct of these snakes also differs from that of vipers or elapids in that they lack strong muscles to push the venom out resulting in a much lower pressure and flow rate. In australia we have only one venomous colubrid, the brown tree snake (Boiga irregularis). Despite being venomous this snake is normally not considered dangerous to humans although they should still be treated with caution and bites to the young or old or from larger individuals could require medical care. I hope I have shed a little light on the amazing apparatus that is the snake fang. This is only an introduction to snake fangs so feel free to comment below with any questions you may have. *Atractaspiddidae is not included here mainly due to the fact its members have a mixture of fang types all of which are covered by the other three families but also due to the ambiguousness of its taxonomy.